The easy-to-use convenience of a slow cooker doesn’t have to be dull and tasteless. Featuring more than 120 fantastic, easy-to-fix, and internationally-minded recipes, Idiot’s Guides: Slow Cooker Cooking, includes beautiful, full-color photography that brings fresh taste and excitement to everything from breakfast and breads to main dishes and desserts. I’m so glad it”s slow cooker season again! I recently took my slow cooker out from its storage place in my kitchen and found a new home for it on my kitchen counter. Slow cooker meals are the best and I’m always on the lookout for new recipes to try. Idiots Guide Slow Cooker Cooking has no shortage of delicious recipes and I’ve already bookmarked quite a few that I plan to try over the coming months. Idiot’s Guide Slow Cooker Cooking is written by a blogger at The Stay at Home Chef! I wasn’t familiar with Rachel’s blog before, but have become a new fan! Her mantra is to cook from scratch, with love. The thing I love most about this book is that these are recipes I actually want to make (and eat). I dislike cookbooks that are loaded with obscure ingredients and require a ton of prep work. In this book, there is barely any prep work (if any at all) and the ingredients are recognizable that I can find in my small town grocery store. And talk about diversity! You’d expect that a slow cooker cookbook would be mainly meat and soups right? In this book you can find a whole lot more including breakfast casseroles, quiches, oatmeal, dips, cakes, brownies and more. Yes, they do have meaty main dishes and soups, chilis and stews. It would be hard to tell you a recipe I didn’t like in this book because they all look drool-worthy. All the recipes have full colour photographs so you can see what the finished dish is supposed to look like. It also serves the purpose of making you extremely hungry as you browse through the pages. You’ve been warned. With Idiot’s Guide they make learning something new super easy! With new authors and new photography, you’ll want to check out this book and the other titles. For more Idiot’s Guides, check out DK Canada’s Boutique and save 30% for a limited time! Connect with Idiot’s Guides on Twitter. Sounds like a good cookbook to add to the collection! Love using the slow cooker this time a year so new recipes to try are always good! I love this – I have tried many times to duplicate recipes for slow cookers and failed..miserably. I think I’ll have to go out and invest in this one! I want to get this book because the Books in series Called the Idiot’s Guide really are easy to follow and very helpful! I would love to get this as a gift for Christmas!! oh how I want a slow cooker! then this would be so handy too. I definitely will need this. It sounds like an essential! Sounds like a good find. We don’t get enough use from our slow cooker. This sounds like the perfect book for me! It’s so nice to come home to a meal made in the slower cooker…much better than the 4:00 p.m., “What am I going to make for dinner?” question! This is what I need as I can never think of what to use my slow cooker for besides chili and soup. I like the recipes! What a great book, I am lazy and would suit me! sounds like a great book for me! We are looking for a new slow cooker and this cookbook will be perfect! Slow cookers are great…warm up the house and fill it with delicious smells. Plus, its wonderful to toss in the ingredients and let it work. This sounds like a good mix of different and the normal comfort foods. Great book to have on hand now that it is slow cooker season! I need this book! I love to use my slow cooker. I just need some recipes that are quick and easy. I am going to put this on my Christmas list. Thanks for the review. 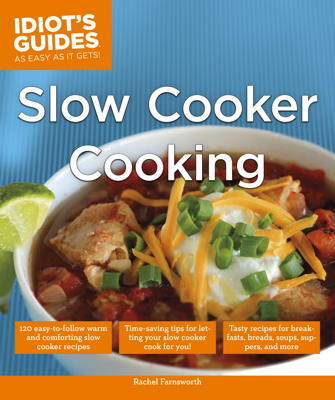 I need this book, since I love my slow cooker. Yay! I love slow cooker meals! Sounds like some amazing recipes! I’m going to have to grab a copy!!! Creamy Whipped Potatoes sounds like a good recipe to check out; I could definitely use this book. I’ve never used a slow-cooker/crock pot before. This book will be my inspiration to try it out! That cookbook sounds like a definite keeper to me! Slowcooking is really one of the best things about The Fall/Winter Seasons. This cookbook sounds like a great collection of recipes especially for this cold, dark time of year! Great idea to dust off the slow cooker! I just bought a stand up pantry and am going to use it for easy access to the appliances I have that are under cupboards and I forget to use when planning meals! Viva fall cooking! Great ideas, I love using my slow cooker in the winter. This sounds like a really interesting book and it would make a good Christmas gift. I think I’m going to have to look for this and prep a couple of the recipes to gift along with the book for new mamas. This sounds like a great book! The recipes sound delicious and I love using my slow cooker! Great review! I love my slow cooker, and open to new ideas. I really like this book, it’s definitely something I would love to own. I like the recipes you’ve bookmarked, I’d like to try these recipes as well. Thank you for sharing this review. I just came across this and have to stop and say thank you so much for your kind review! It means the world to me!